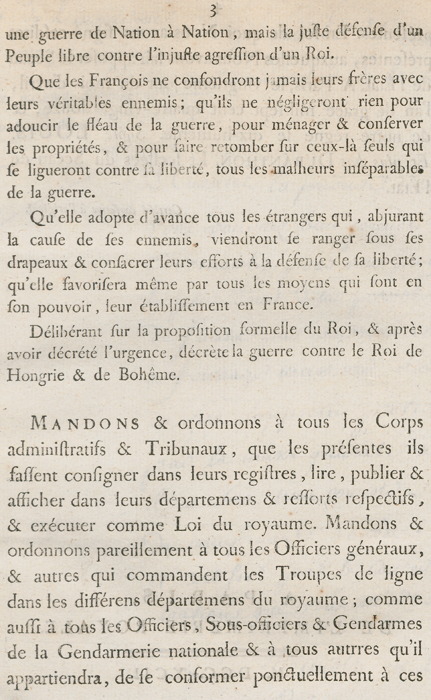 The extreme hostility from the monarchies of Central Europe against revolutionary France led to the declaration of war on 20 April 1792. 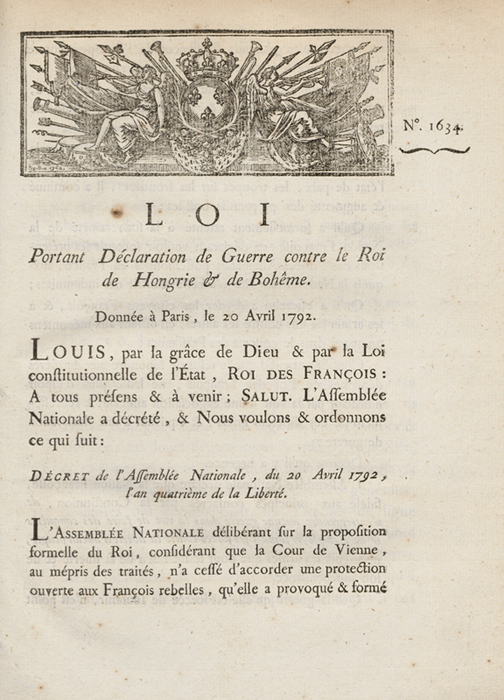 This declaration was preceded by an ultimatum France had presented to the King of Bohemia and Hungary on 25 March 1792, ordering King Francis I to disperse the large exiled French royalist faction assembled on the frontiers in the Rhineland, as it posed a threat to France. 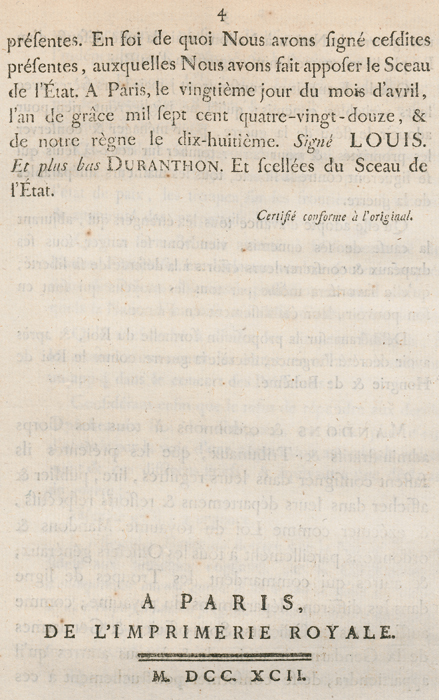 Above, on page 2, one can read the accusation the Nation Françoise addressed to Francis I who rejected the ultimatum. On 20 April 1792, King Louis XVI, “King of the French” and no longer “King of France” as stated in the Constitution of 1791, came to the Legislative Assembly. 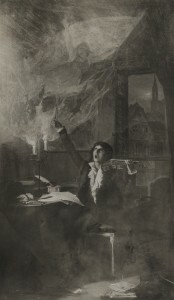 Charles-François Dumouriez, acting as new minister for Foreign Affairs, read the report for the proposal to the declaration of war that was to be signed by the king. The Assembly adopted the proposal by 750 votes to 7. 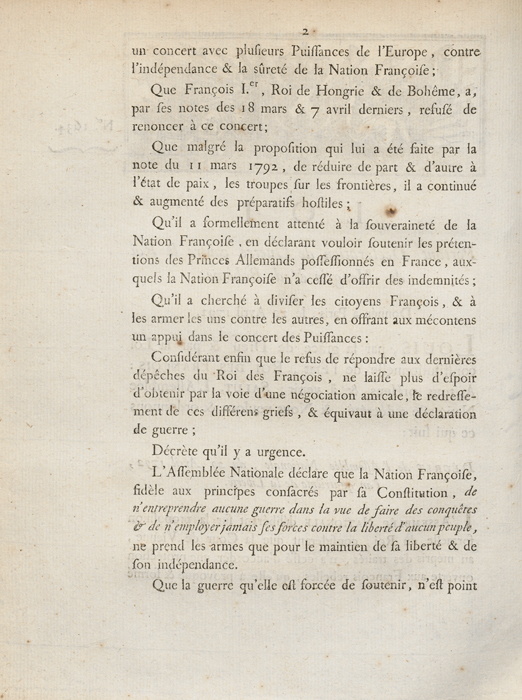 On 25 April 1792, the mayor of Strasbourg, Baron Philippe Frédéric de Dietrich, plastered the walls of the city with broadsides used for proclamation of the declaration of war and greeted the volunteers during patriotic rallies. 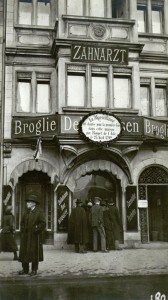 It is believed that during a reception given the same evening, de Dietrich deplored that there was no appropriate song to fit the new developments. 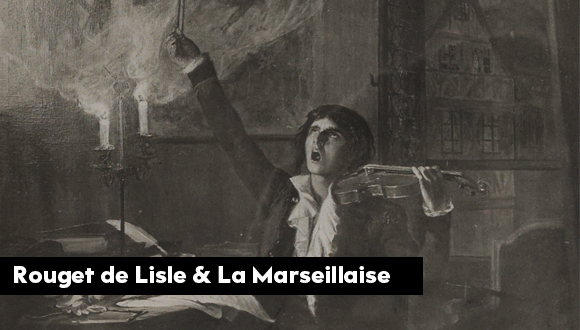 He turned to Rouget de Lisle, known for his taste in music and poetry, and said : “Monsieur de Lisle, please write for us a fine song for this soldiering people springing up from everywhere to protect their endangered fatherland, and you shall be worthy of the Nation”. 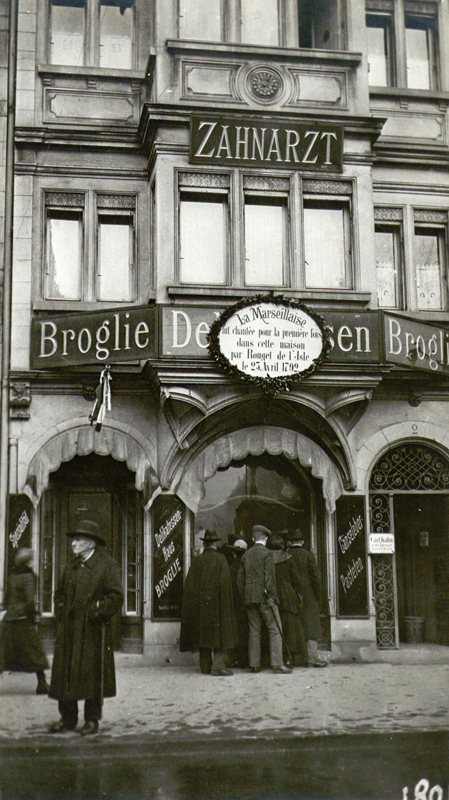 At the end of the evening, Rouget de Lisle returned home where he wrote the music and the lyrics of the Chant de Guerre pour l’Armée du Rhin (War Song for the Army on the Rhine). The following morning, he visited the Baron de Dietrich. Greatly inspired by the new song, the mayor brought together the same guests as the evening before and performed the new song in his tenor voice, accompanied by Rouget de Lisle on his violin and his wife or niece on the piano. Before Philippe-Jacques Dannbach printed the song dedicated to Marshal Nicolas Luckner commander the Army of the Rhine, the Dietrich family, soldiers and officers garrisoned in or passing through Strasbourg and traveling salesmen begun spreading all over France handwritten versions of the song. Many printers followed suit.